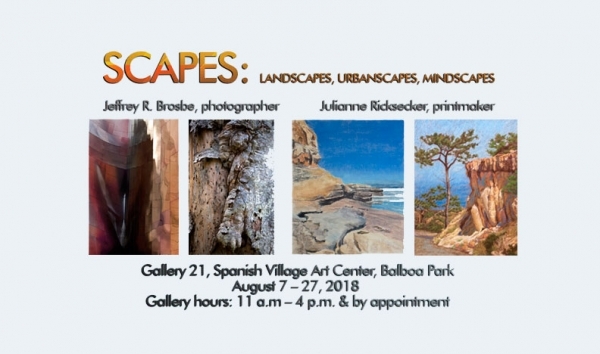 Event Description Two award winning San Diego artists have teamed up to present “SCAPES: Landscapes, Urbanscapes, Mindscapes”, an exhibit of fine art at Gallery 21 in Spanish Village, Balboa Park. Julianne Ricksecker, painter and printmaker, and Jeffrey R Brosbe, photographer, invite the public to join them for an opening reception on Sunday, August 12 from 5 - 7 PM. The Gallery will be open daily from August 7 through August 27, 11 AM - 4 PM or by appointment.